I just finished an inspection where the floors appeared to be solid hardwood but there was no real way (that I know of) to tell. For the life of me I couldn't find a floor register or any other area to look at the edge of the boards. I hate to say it is solid hardwood when it may be engineered hardwood, and for that matter, some laminates these days are really good. I did notice that some of the strips (at thresholds mostly) had been face nailed with finishing nails and patched over with a tiny speck of matching putty. Is that some kind of clue? Is there any way to tell by looking at the surface? Laminate usually uses plastic trim. Wood is wood, except that solid wood can be refinished, whereas engineered has a very thin refinish layer. And that would be the reason to distinguish between the type of wood floor. Ya! gotta bite your teeth in it to make sure! Like a silver or gold coin. We inspect the floor . If you want to inspect the floor covering that will be up to you. There is a very big difference between floor covering and the floor...The essence of what is floating the covering is the floor. Now! If the covering has issues that I don't like I report it. But, draw the the line between the floor and the floor covering..OK? That crap advice may work for you in Florida with your "cheaper the better" construction methods, but it would never fly in the real world where we actually value our building materials and 'finishes'. You have been doing it wrong for all these years..Yep! Poor old decrepit thing ! Don't know the difference between a floor and floor covering! If there is a floor register, pull it out and look at the floor material. The easiest way I know to tell the difference on a slab floor is laminate flooring will have a slight dip where the joints meet. Hardwood floors will be sanded completely smooth. If the floor is fairly new there is usually a box with some spare left over pieces stored somewhere. If you have the right tools, you could probably find a short baseboard section that can be carefully pried off and replaced afterwards, not something I would do tho. 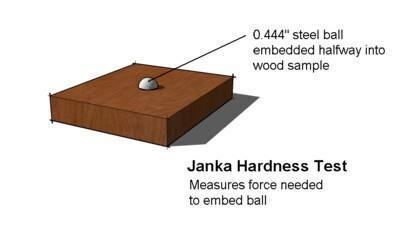 You need a ball bearing to test for the hardness. Hardwood grains are random and so they do not have any repeating patterns. But with laminate floors, you will find patterns repeating every few boards. You may find an occasional nail around the border for hardwood flooring. Hard wood is more prone to dings and scratches so if there are a lot of dents, the floor is more likely to be natural hardwood than laminate. Hardwood is more prone to staining and fading. So with hardwood floors you are more likely to find water marks and faded or discolored areas.